Pickled Fish | Jake & Sam -- Let's Cook! The thought of pickling fish is hardly something to make you salivate, but please don’t be put off by the name. 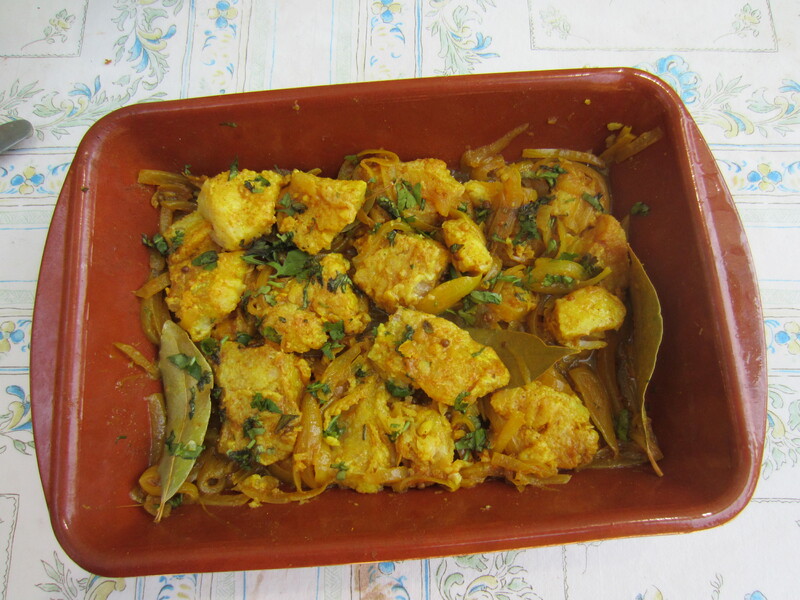 It should be called Absoutely Delicious Cold Curried Fish. It’s perfect summer fare, keeps in the refrigerator for a week and is delightfully different. There are many South African dishes of Malay origin. Malays, mainly Javanese, were first brought to the Cape as slaves in the 17th century and were in time valued for their cooking skills. 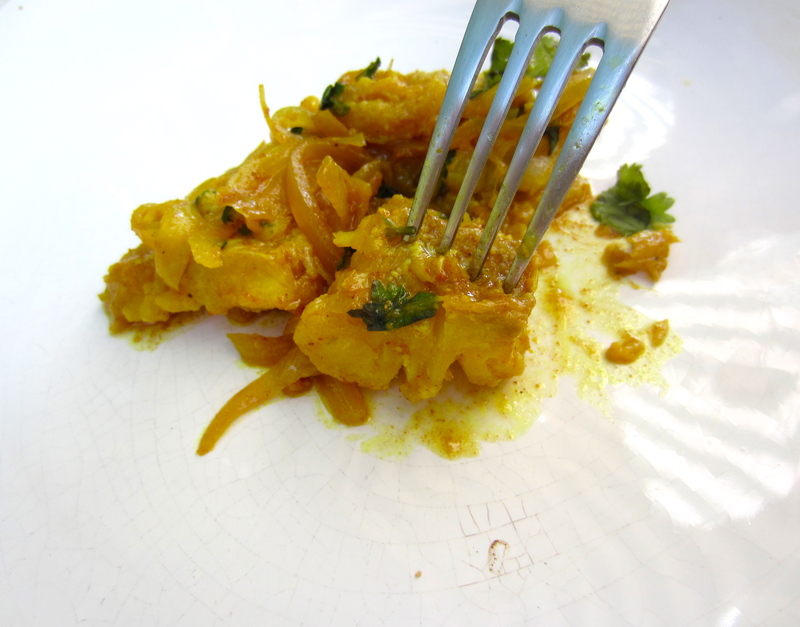 Cape Malay curries tend to be sweet-sour and are less spicy than their Indian cousins. You can serve pickled fish as a first course or as a main course with a salad such as the herbed potato salad in the previous blog and a plate of sliced tomatoes. Cut the fish into approximately 2″ x 2″ chunks. Pat it dry and coat it lightly with the seasoned flour (I shake it gently in a plastic bag). Heat 2 tablespoons of the oil in a pan large enough to hold the fish in one layer. Fry the fish in the hot oil for 2-3 minutes a side, depending on its thickness. Do not overcook. Drain the fish on paper towels and allow to cool. Make the sauce: Fry the onions in the remaining tablespoon of oil over low heat for five minutes then add the garlic, curry powder, turmeric and coriander, stirring the spices around for a few minutes to release their aromatic oils. Add the vinegar, sugar and water, bring to the boil and simmer the mixture gently for 10 minutes. Add salt and check that the vinegar-sugar ratio suits your taste. Let cool. Assemble the dish: Put half the sauce and the onions on the bottom of a dish that will hold the fish in one layer. Cover it with the fish and the remaining sauce and onions. Tuck the bay leaves in between and sprinkle with the optional cilantro. Cover with plastic wrap and refrigerate for at least two days, turning the fish over after a day. Serve each portion with some of the sauce and the onions. It will keep in the refrigerator for at least a week. OK Jake, I’m sold on the pickled fish part, but can you suggest any fish other than cod? my least favorite fish in the world!!! Hi Molly — This dish is beautiful, delicious, keeps in the fridge, perfect for a summer lunch. If you don’t like or can’t get cod, I would try it with monk fish or perhaps mahi-mahi. But I think once you taste this recipe with cod — you may find that you like it after all!